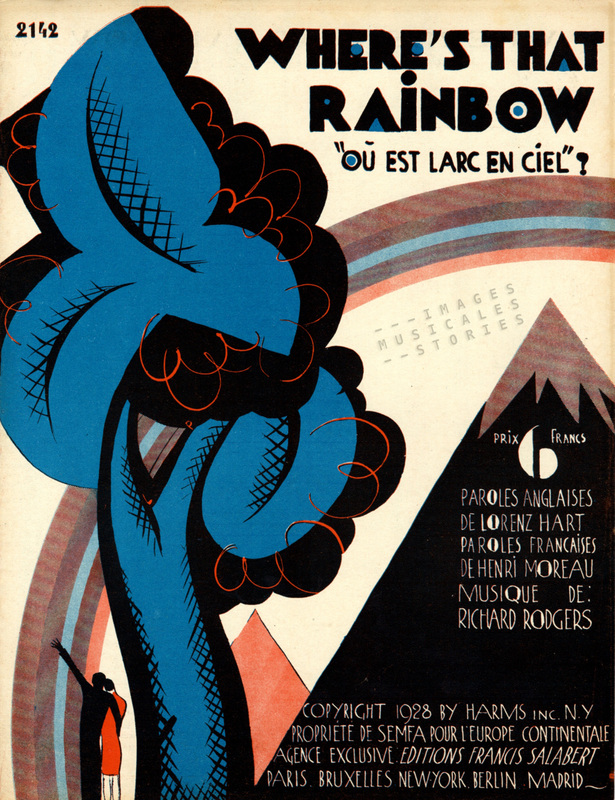 ‘Where’s that rainbow‘ by Richard Rogers & Lorenz Hart, published by Salabert (Paris, 1928). Illustration attributed to Roger de Valerio. The song Where’s that Rainbow was originally written in 1928. Much later it was sung in the film Words and Music, a fictionalized story about the songwriting duo Rodgers and Lorenz. In this clip of the 1948 film, it is not the song but the rainbow-coloured petticoats that steal my attention! 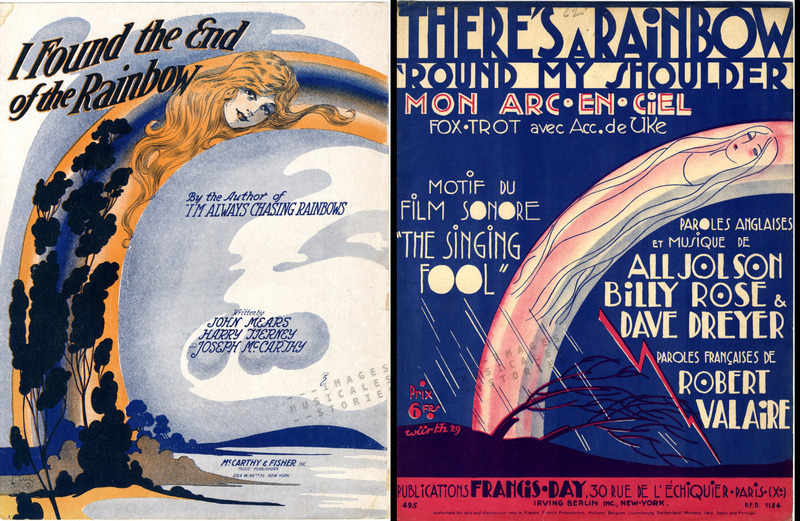 Chasing rainbows in our collection, I found these two similarly inventive illustrations. The right one is by Würth for There’s a Rainbow round my Shoulder (1928). He may have been inspired by André de TaKacs‘ drawing of 1918 for the song I Found the End of the Rainbow. Left: ‘I Found the End of the Rainbow‘ by Mears, Tierney & Mc Carthy, published by McCarthy & Fisher inc. (New York, 1918) and illustrated by André De TaKacs. Right: ‘There’s a Rainbow round my Shoulder‘ by Jolso, Rose & Dreyer, published by Francis-Day (Paris, 1928) and illustrated by Würth. 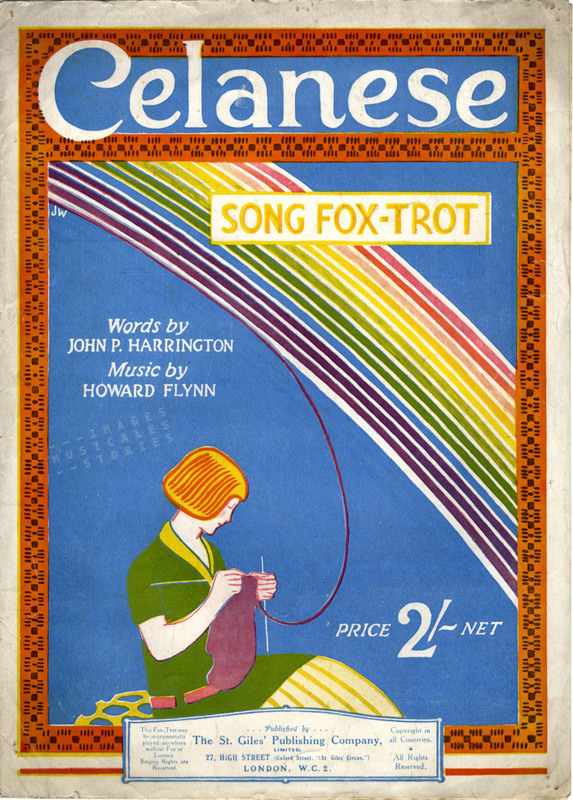 Celanese’, by Howard Flynn and John P. Harrington (The St. Giles Publishing Company, London, 1923). Illustration J. W.
All these rainbow images are but a preamble to share with you a gem of a short film by Len Lye. In 1936 Lye, born in New Zealand, made an experimental film in England promoting a Post Office Savings Bank. It was called Rainbow Dance and ended with the words: “The Post Office Savings Bank puts a pot of gold at the end of the rainbow for you. No deposit too small for the Post Office Savings Bank.” The film is an experiment with colour and rhythm. In it Lye uses abstract backgrounds, collage effects, live footage and direct-to-film animation effects. The psychedelic film starts with purple rain avant la lettre. Then we see a city dweller morphing into coloured asterisks, a musician, a hiker and a tennis player. When the tennis player makes a leap, he leaves behind a trace of colourful silhouettes like a futuristic painting. Be patient please, we’ ll show the film at the end. But first this. 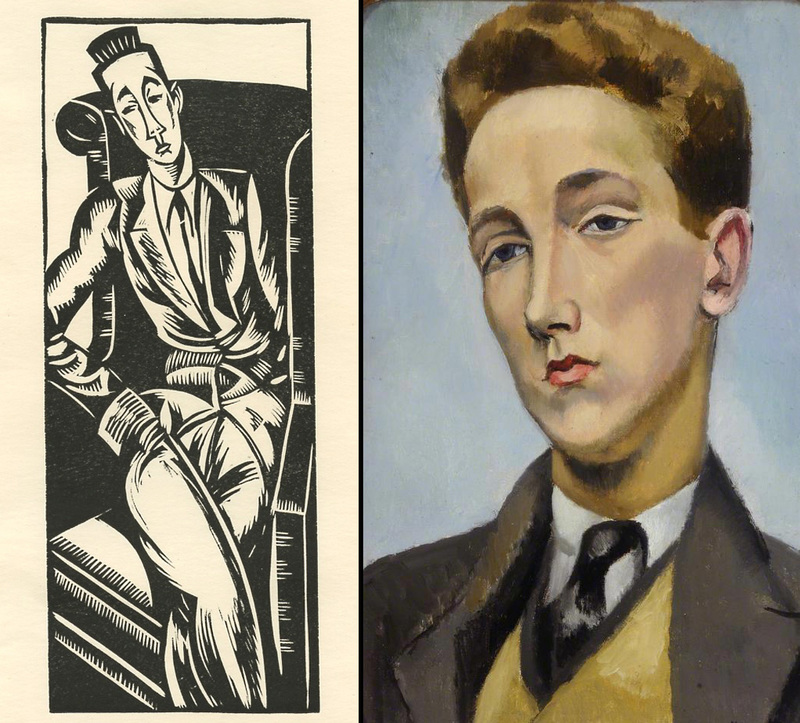 Left: Rupert Doone, woodcut by Edward Wadsworth (1921). Right: Rupert Doone, by Nina Hamnett, Copyright Doncaster Museum. The silhouetted dancer in Lye’s Rainbow Dance is Rupert Doone, a one-time lover of Jean Cocteau. While Doone whirled his moves before a white screen, a gramophone played Tony’s Wife, a wonderful rumba by Burton Lane. 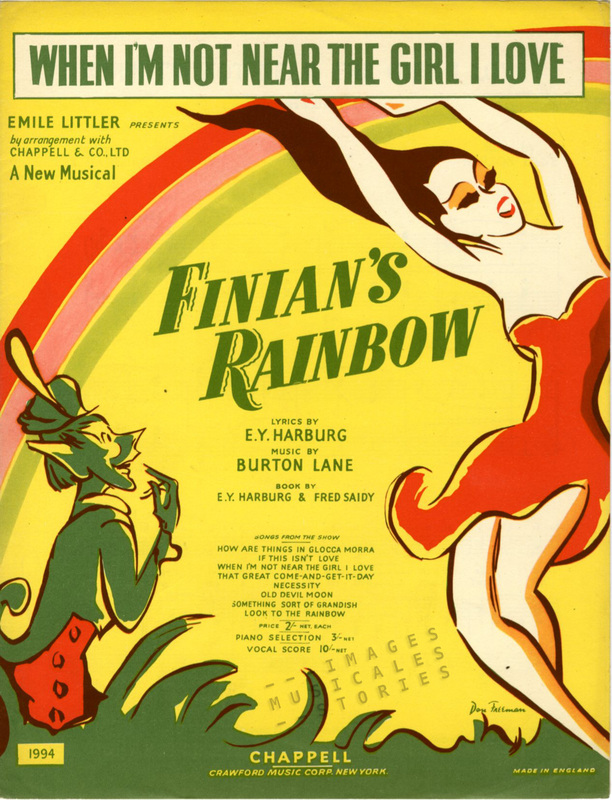 Lane would later compose the score for the musical Finian’s Rainbow: a story about an Irishman who has stolen a leprechaun’s pot of gold. ‘When I’m not near the girl I love‘ from Finian’s rainbow by Burton Lane and E. Y. Harburg, published by Chapell & C° (London, 1946) and illustrated by Don Freeman. I’ll let you decide what to think of Francis Ford Coppola’s attempt to turn the musical into a film. In the clip Tommy Steele plays an obnoxious leprechaun and Barbara Hancock a dancing nymph. It was filmed in 1968, but even then must have looked outdated. And now the long-promised Rainbow Dance, the phantasmagorical 1936 film by Len Lye. Feast your eyes ! Actually the lady is knitting with celanese, a combination of ‘cellulose acetate’ and ‘ease of care’, referring to the easy wear of acetate fabrics, as promoted by the chemical company Celanese.